Color fundus photographs and Fundus fluorescein angiograms (FFA) of wild -type (WT), Kimba, Akita and Akimba mice. WT mouse showed regular arterial and venular caliber, branching, and tortuosity in the retina - A–F. Kimba mice had multiple spots of hyperfluorescein (bright spots) throughout the retina - G–L. Akita mice displayed a slight increase in tortuosity with no signs of leakage - M–R. Akimba mice showed vasculature abnormalities inherited from parental strains, with high severity of leakages accompanied with tortuosity and significant loss of capillary density - S–X. Credit: Shyam Chaurasia. UM News Bureau. This article has been republished from materials provided by MU News Bureau. Note: material may have been edited for length and content. For further information, please contact the cited source. Chaurasia, S. S., Lim, R. R., Parikh, B. H., Wey, Y. S., Tun, B. B., Wong, T. Y., ... & Rackoczy, E. (2018). 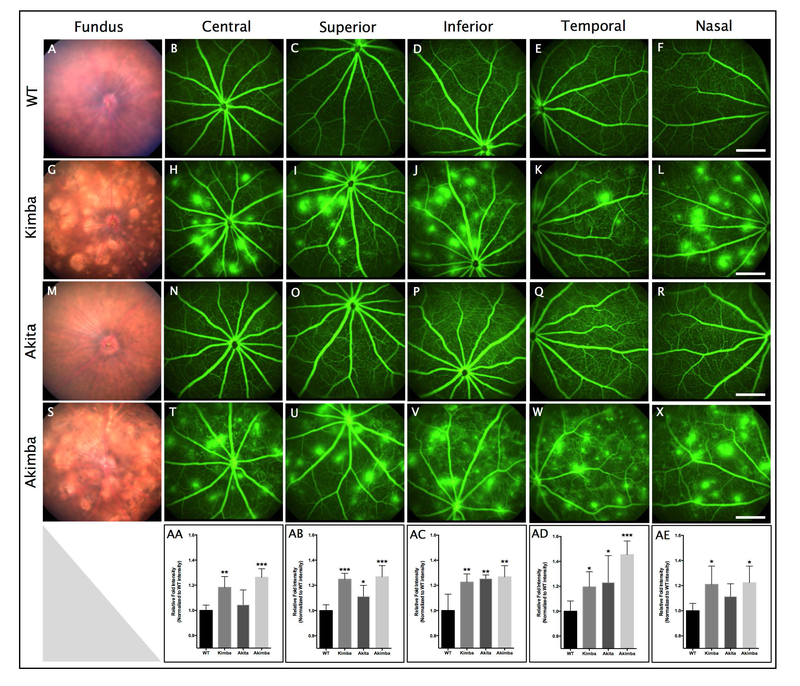 The NLRP3 Inflammasome May Contribute to Pathologic Neovascularization in the Advanced Stages of Diabetic Retinopathy. Scientific reports, 8(1), 2847.